Have you ever wanted to edit audio on your PC? Maybe you want to remove the unwanted parts of an audio, increase the volume of a speech or there are unwanted background noises present, and etc. Dexster Audio Editing software is just the right software you need when it comes to editing audio on your PC. It can be used to perform various types of audio editing tasks such as audio cutting, deleting, mixing, splitting, add audio effects or filters, noise or vocal removal, audio recording and more. It is easy to use Dexster to edit audio. Most of the time, it only required 4 steps to complete various types of editing task. Dexster supports a wide range of audio formats which include MP3, WAV, AIFF, FLAC, WMA, OGG, AAC, M4A, Audio CD, MP4, etc. The first step to edit audio is to open the audio file that you wish to edit. Just click on the File menu, and select Open. 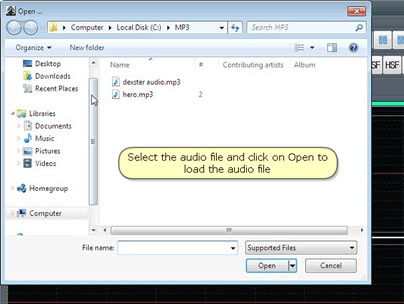 Then choose the audio file to open for editing. Select the audio portion that you would like to edit. 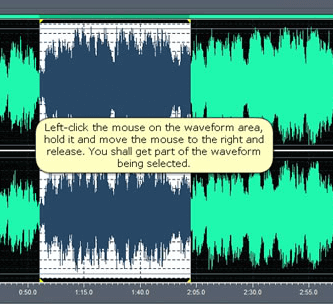 Left click and hold your mouse on the waveform area, move the mouse to the right and release to complete the audio selection. The selected time for the audio portion will be displayed on the status bar. You can also play to preview the selection. ii) To apply audio effects to the selected audio portion, click on the Effects menu and choose one of the available audio effects. 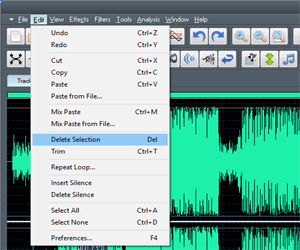 ii) To improve the audio quality by removing noise, clicks and pops, click on the Filters menu and select Audio Restoration. There are much more you can do with Dexster, do check the tutorials page for more guides. Once the editing task is over, click on the File menu, and select Save to save the edited audio. Click here for more information on Dexster or download the free trial now.